Recipe for The Best Brined Whole Turkey & Great Tips on How to Prepare a Juicy Bird and Carve it without Fuss. It will be the talk of your holiday party! Thanksgiving is coming up in just a few weeks. Are you already starting to get anxious? Well, don’t be! We are here to help you… to make your life easy. 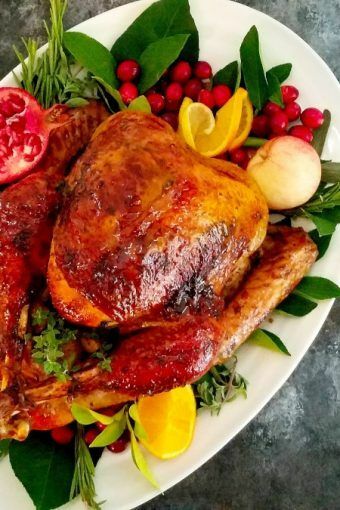 For this reason, we’re sharing the best brined whole turkey recipe ever… and of course, simple tips on how to prepare a juicy bird, the star of any Thanksgiving table. We will also guide you on how to easily carve your turkey. Ready? If you intend to prepare a roasted turkey from scratch, it is essential to choose a fresh turkey instead of a frozen one. The freezing process damages the turkey’s cells, making meat more susceptible to drying out during the roasting process. The size of the bird will depend on the number of guests, of course (estimate one pound of turkey per adult). But for a quicker cooking process, consider roasting two small turkeys instead of a large one. Brine the turkey, this means submerging the bird in a mixture of salt, sugar, and cool water. It can be an overnight brine (8-12 hours) or a quick brine (5 hours but with double the amount of sugar and salt used for an overnight brine). Why? It will help to keep the turkey moist during the roasting process! Before brining, don’t forget to remove turkey’s neck and giblets from the cavities. If desired, reserve them to make gravy. Wash and pat-dry the brined whole turkey, removing the excess salt and giving it the ability to take on a golden brown color during the roasting process. Rub a mixture of softened butter and chopped herbs under the breast skin (and spices if desired), so that it bastes the bird and adds flavor as the butter melts during the roasting process. This will prevent the breast, which cooks faster than the legs, from drying out. Brush a mixture of vegetable oil and herbs all over the turkey, except under the skin. This will help the turkey get that beautiful golden brown color and herby flavor. I find oil better than butter when it comes to achieving that desired golden brown color on the skin. If choosing to stuff the turkey, make sure to add great flavor such a delicious stuffing, or simply aromatics (e.g. sliced lemon or orange, chopped onions, apple or pear chunks, and fresh herbs). It will without a doubt boost the flavor, although will add to the cooking time. Tie the turkey legs and tuck the wing tips under the turkey. These will give the turkey a nice look at serving time. Place liquid, preferably a flavorful one such as broth and/or white wine, in the bottom of the roasting pan. This will prevent the drippings from burning. The same liquid can also be used to baste the turkey every 45 minutes. The liquid, as it evaporates, will also contribute toward keeping the turkey moist. Roast the turkey on the middle oven rack in a rack roasting pan, first at high temperature (450 to 475°F) and then at a low temperature (325 to 350°F). The high temp will brown the turkey and the low temperature will cook it through. Some recommend roasting the turkey breast-side-down at first in order to keep the breast moist (allowing it to self-baste in the juices). But I prefer a different method: I like to roast the turkey breast-side-up in order to brown for the first 45 minutes, and then to place a piece of aluminum foil over the breast to allow it to cook while still protecting the moisture. This way you can both get the rich outer color and retain the inner juiciness. Avoid overcooking the turkey. 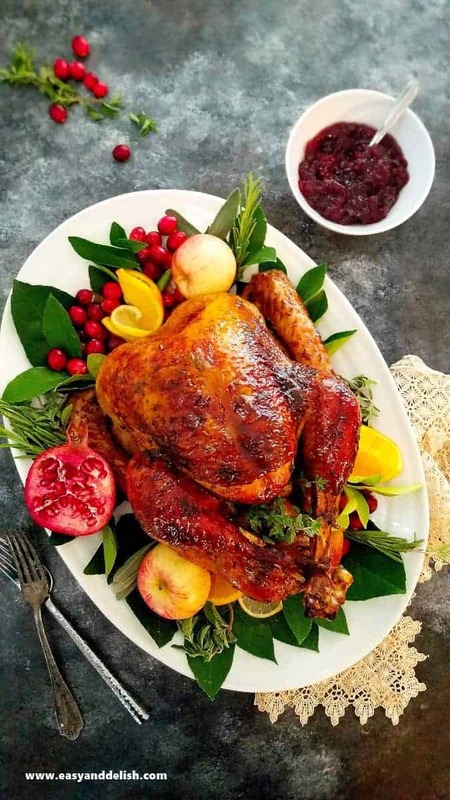 For a brined whole turkey with stuffing, the required roasting time is 15 minutes per pound; for a brined whole turkey with no stuffing, it is 13 minutes per pound. For example: a brined, stuffed 12-pound turkey will take about 180 minutes or 3 hours to roast. The best way to check for proper cooking is to insert either an instant-read or probe thermometer into the thickest part of the thigh (without touching the bone). A safe temperature must register 165°F. Once removed from the oven, let the brined whole turkey stand for 20 minutes before carving. This will help it to lose less moisture during carving. Note: Don’t let turkey sit at room temperature for more than 2 hours, otherwise it will increase the risk for food-borne illness. Cut legs tie (kitchen string) and remove drumsticks. To do this, hold each drumstick and cut through skin all the way to the joint. Remove by pulling out while using point of knife to disjoint, and then separate thigh and drumstick at joint. Cut wings off. Insert a fork into the upper part of the wing and then make a long horizontal cut above wing joint through to the body frame. Cut wing off. Slice breast. Using your fingers, find the breastbone in the middle, between the two breasts. Then, position a boning knife on one side of it, and slice from top to bottom, as close to the bone as possible. Using the other hand, pull the meat away from the breastbone. Repeat on the other side. Transfer breasts to a cutting board and slice against the grain (i.e. shorter length of the breast), leaving skin attached. Remove remaining meat from the carcass by hand. 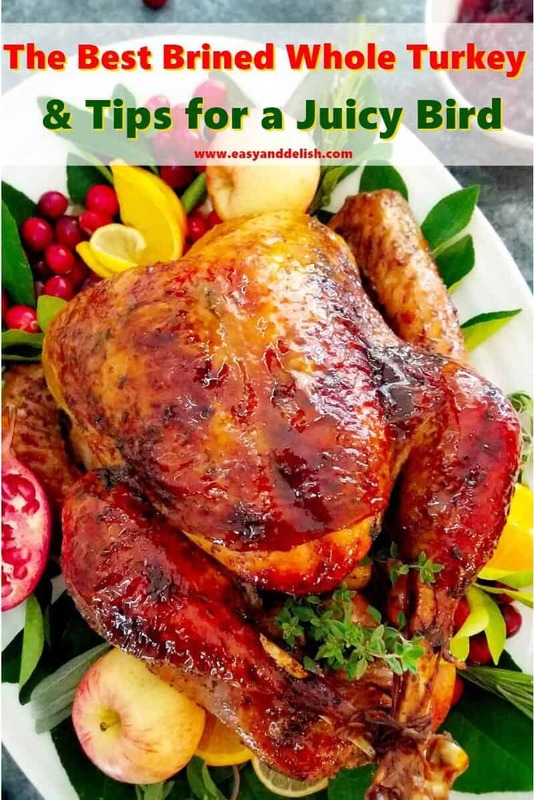 You will wind up with lots of shredded pieces that can be used to make various dishes afterwards or even to serve on the platter along with other parts of the turkey. Arrange all pieces on a platter. 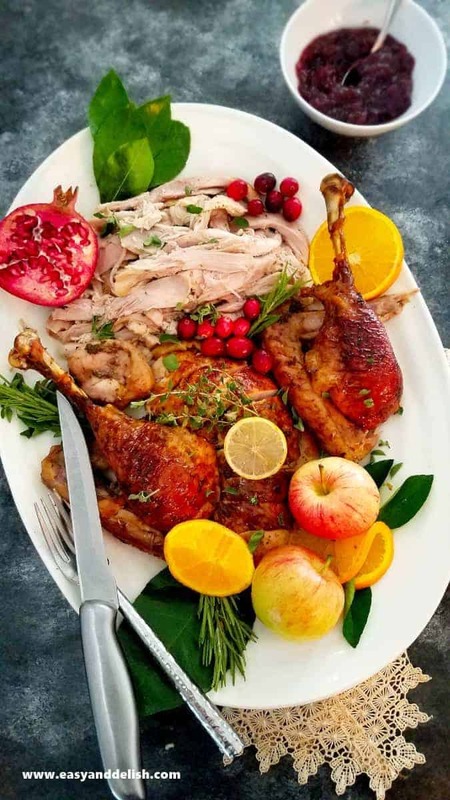 Recipe for The Best Brined Whole Turkey and Great Tips on How to Prepare a Juicy Bird without Fuss. Remove giblets and neck from the cavity of the turkey. If desired, reserve for making gravy. For the Brine: Combine coarse salt and sugar in a large clean stockpot and mix with enough cold water to submerge the turkey. Let the mixture of salt and sugar dissolve completely before placing the turkey into the pot. Cover and refrigerate overnight ( for 8-12 hours). Remove the turkey from the brine, and rinse inside and out under cold running water to remove all traces of salt. Then, pat dry with paper towel. For a quick brine instead (if you are in a rush), brine the turkey for only 5 hours, but this time using double the amount of salt and sugar. Follow the same process describe above. Roasting: In a small bowl, mix the softened butter with half of the amount of salt and pepper, and 1 Tablespoon of the chopped herbs. Place turkey breast-side-up on the rack of a roasting pan. Gently rub the butter mixture under the breast skin. Then, mix the oil with the remaining salt, pepper, and chopped herbs in a different bowl. Brush the oil mixture all over the turkey, except under the skin. Place aromatics in the cavity. Tuck the wing tips under the turkey. Tie the legs together with kitchen string. Pour the 1-3 cups of broth and/or wine into the pan bottom to prevent drippings from burning. Amount of liquid will depend on the height of the rack, but don't let liquid touch the turkey. Roast turkey in the oven middle rack at 475 degrees F for 45-50 minutes or until breast skin turns golden brown, baste with the liquid from the bottom of the pan, and then rotate the roasting pan. 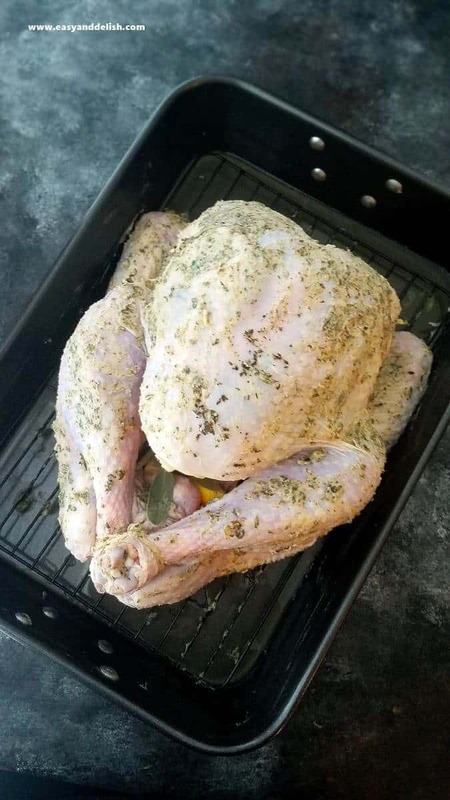 Cover just the breast with a piece of aluminum foil, reduce oven temperature to 325 degrees F, and continue roasting for additional 125-130 minutes or until turkey is fully cooked (a thermometer inserted into the thickest part of the thigh without touching bone reaches an internal temperature of 165 degrees F). Turkey must be basted every 45 minutes. If desired, brush turkey with a mixture of 1/4 cup soy sauce and 1/4 cup honey 30 minutes before removing from the oven. It will make the turkey even more flavorful. I did this with mine! NOTE: For a brined, stuffed whole turkey, the roasting time is 15 minutes per pound; for a brined, unstuffed whole turkey it is 13 minutes per pound. Remove the brined whole turkey from the oven and let stand for 20 minutes before carving. Take care of turkey leftovers easily! Make our Tex-Mex Chili Bean Turkey Pot Pie. Can’t wait for Thanksgiving! 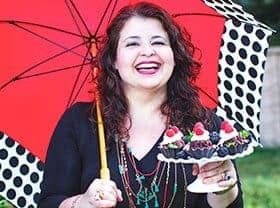 This is such a wonderful post, full of tips and ideas for a fabulous celebration! I have never cooked a whole turkey, but was thinking to make one for Christmas this year. Your recipe sounds great, especially the brining part, I have tried that with smaller parts of turkey and with pork and the results have always been delicious! The photos are fantastic, my mouth is watering! What a beautiful bird and great tips Denise! Brining poultry really brings out the flavor, doesn’t it? And turkey really can use the extra oomph that brining brings. Terrific post — thanks. This is one beautiful turkey. It looks so juicy and golden brown. Great tips on everything. Wishing you a Happy Thanksgiving!